Taiwanese Superstar Fong-Pang Chao earned his 3rd career Challenge of Champions win on Thursday at the Mohegan Sun Casino in Uncasville, CT. The final match came down to Chao against defending champion Thomas Engert from Germany. 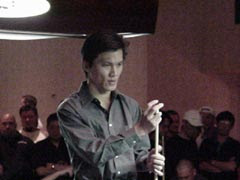 Chao came into the final match with wins over Corey Deuel and Niels Feijen, while Engert had wins over Efren Reyes and Gabe Owen on his way to the finals. The first set of the finals was close with Chao pulling out a hill-hill win, but the second set highlighted a more dominating Chao as he cruised to a 5-1 win and the first place prize of $50,000. Most of the players that competed in the event were on their way to New York for the Big Apple 9-Ball Classic that kicked off today.